Flea & Tick Protection For Your Cat At A Better Value! Same active ingredients used in FRONTLINE® Plus. 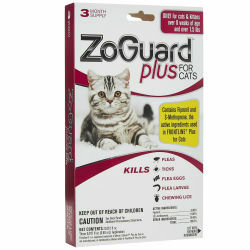 Use ZoGuard® Plus for Cats monthly for complete control of flea, tick, chewing lice, and mosquito infestations. Remains effective even after bathing, water immersion, or exposure to sunlight. Do not apply to cats weighing less than 1.5 lbs.